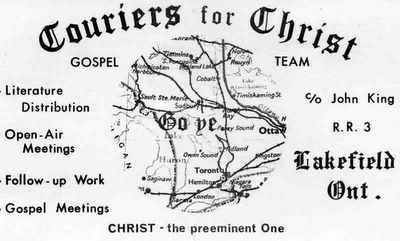 Recently I found this Couriers for Christ prayer card and my mind went back to those days in the mid to late 60's when a team of young people from the Peterborough area went around singing and preaching. Those were good old days. On Sunday evenings we'd sing in a park in Lakefield as part of Lakefield Gospel Chapel's Open-Air Services. One summer John King, Carl Whitehead, Brice Martin and I drove to Wawa, north of Sault Ste. Marie, and did door-to-door tract distribution. We took a tent trailer and stayed at a campground in the area. Each night we would put on a concert (???) in the park. John would play his saw, yes, that's right, his saw, Carl would squeeze some tunes out of his accordian and I had an old pump organ that kept my legs busy. We'd always draw a crowd. Maybe they wondered what the racket was. We had great times back then. I'm grateful that God touched my heart back in those days and called me to serve Him. For many years I owned the local Christian bookstore and preached a lot on the weekends. Epistle Sports Ministries was formed in 1975 and continues to this day. John King went with Wycliffe Bible Translators and still serves with them. I played the organ at John & Laura's wedding. Carl also serves with Wycliffe in Papua, New Guinea with his wife Pat. I was Carl's best man at their wedding in Winnipeg. Brice went to seminary and went on to pastor a church. 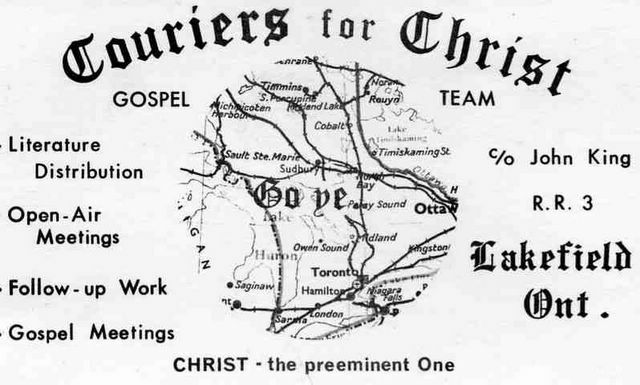 We all got our start with Couriers for Christ, a makeshift ministry that we started when we were young men. Those are fond memories! Paul challenged Timothy and told him to let nobody despise his youth. God calls and uses young people to accomplish His purposes. I'm grateful for those early opportunities to serve Him. Just goes to prove that the Lord of the Harvest can use anybody. Let Him use you to make a difference! Amen to that! Thank you for sharing such beautiful memories.